Staff Sgt. 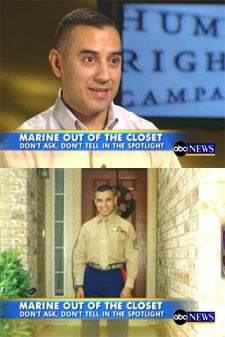 Eric Alva, who was the first Marine seriously wounded in the war with Iraq, will come out of the closet today, standing by Rep. Marty Meehan, D-Mass and a bipartisan congressional group at 2pm as they introduce legislation calling for the repeal of the military’s “Don’t Ask, Don’t Tell” policy. Alva was visited at Bethesda Naval Hospital by President George W. Bush, first lady Laura Bush, Arnold Schwarzenegger, Donald Rumsfeld, and Michael Jordan. None of them knew he was gay. It’s long past time for this policy to go. Thank you, Eric Alva, for coming out.